This interesting North Yorkshire town has some lovely riverside trails along the River Swale and two fine long distance trails to try. It sits on the north eastern edge of the Yorkshire Dales National Park where you can visit highlights including Aysgarth Falls and Castle Bolton. This circular walk around the town visits the rushing waters of Richmond Falls and the historic Richmond Castle on the River Swale. Starting at the market place, head along New Street and turn left onto Bridge Street. Cross the river on Richmond Bridge and you can pick up a footpath on the southern side of the water. Follow the path round to the A road and then cross over to the other side. You can then pick up paths on the northern side of the river to Richmond Falls. After wet weather the falls can be very dramatic. 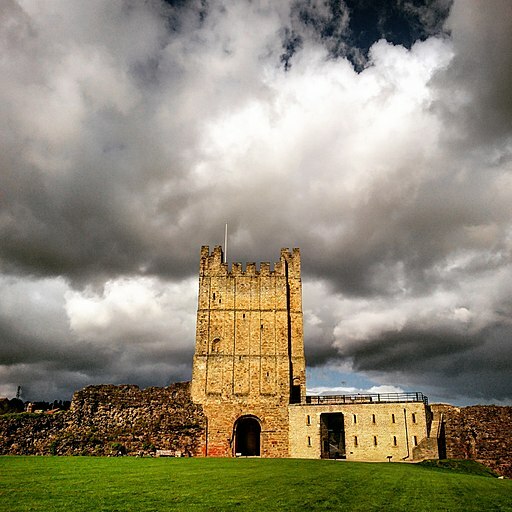 The path continues to Richmond Castle which is Grade I listed and dates from the 11th century. The castle has one of the finest examples of Norman buildings in Britain including Scollands Hall, the Great Hall of the castle. There's also an impressive 12th-century keep which is 100 feet (30 m) high. To continue your walking in the Richmond area you can pick up our River Swale Walk from Richmond Bridge. It heads west from the town, visiting a series of nice riverside woodland areas. Wainwright's Coast to Coast passes through the town and is another great option for walkers. If you follow it west you can visit Whitecliffe Woods, Applegarth and Marske. Heading east will take you along the river to Brompton-on-Swale. The Richmond Way long distance footpath starts at Richmond and is another great way of exploring Swaledale on foot.